Take an alien invasion, a high school catfight, a missing space princess (in more ways than one!) and add plenty of high explosives. This is what you'll wind up with ... one of the funniest films ever made! A-ko is a lively seventeen-year-old, no different from any other...except for the fact that within her diminutive frame lies a strength that can only be described as superhuman. She'll need every bit of her power to fight off her teenage rival, not to mention a monstrous alien spaceship hurtling towards Earth in search of...? 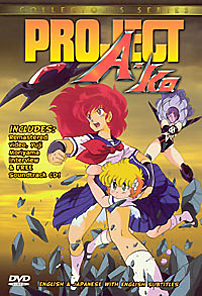 BONUS: includes the Project A-ko Soundtrack CD! DVD Features: Yuji Moriyama Commentary & Interview, Comic to Film Comparison, Music Videos, Behind the Scenes from Japan, Fan Art Contest, Restoration (Video Featurette), and Trailers & TV Spots. DVD-ROM Features: Art Gallery, Graphic Novel, Script, Cast & Production Credits, and more!